Where are the wild things? They have busted into tiny little pieces, found themselves packaged and await your creative prowess. Donna Wilson, the UK’s queen of knitted creatures, brings you this craft kit. Each ‘Make Your Own Monster’ kit is unique. They contain everything you need to whip up your own masterpiece. To get you started Donna Wilson includes a pre-stitched creature shape and stuffing. Your monster’s facial expression and composition is up to you. For monster inspiration see what other mums, kids and gift bearers have come up with at Cyril Squirrel Fox’s photo stream. The site is teeming with quirky eyes and big teeth. You may also find inspiration in Donna’s own signature toys. They’re packed with character. Take ‘Rudie the Racoon’ for example, he’s slim and sneaky looking, like a robber. According to his profile he loves rummaging through people’s possessions and dislikes cats because they smell funny. The entire Donna Wilson range boasts character and quirk. An early batch of knitted creatures was shown at Donna’s final college show in 2003. They sold out and the Donna Wilson brand was born. Now the design studio crafts a plethora of product for twenty-five countries. 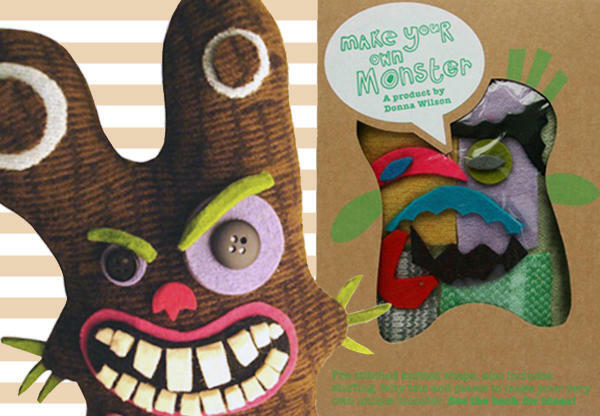 You can find Donna Wilson’s Make Your Own Monster kit at Third Drawer Down for $34. Other products include wooly baby blankets (shown below), ceramics, adult fashion accessories and home furnishings. For more kit ideas see our 2011 round up. Happy crafting!